A ray of sunlight during a rainstorm, originally uploaded by Brin d’Acier. There was a break in the clouds and the sun transformed the highway into a river of gold. I spent my lunch hour trying to capture the effect. This is a view from the city of Espoo towards Helsinki. The little peaks you can just barely make out behind the bay are in downtown Helsinki. In the summer I come to work by bicycle, on a bike path running in the woods on the right side of the highway, over a series of little islands. 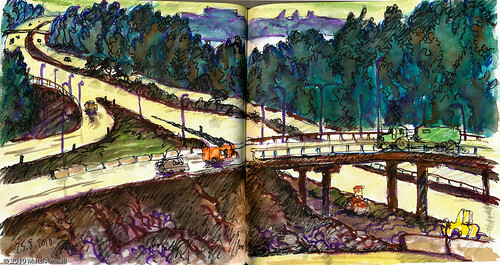 This entry was posted in Sketch of the day, Sketchbook and tagged espoo, finland, ink. Bookmark the permalink.